The flower that blooms at night releases an iconic, calming aroma from beautiful yellow blooms. Native to the islands of the South Pacific, ylang ylang trees produce deeply fragrant yellow blossoms that only bloom at night. For centuries, ylang ylang essential oil has been valued for its calming, uplifting properties and its sensual, soothing aroma. Sweetly floral and warming, ylang ylang is used as a sedative, to help relieve nervousness, restlessness and PMS symptoms; also helps balance skin’s natural oil production and relieve acne. Ylang ylang trees are native to Philippines, Malaysia and Indonesia, and are grown in Madagascar, Polynesia, Melanesia, Micronesia and the Comoros islands. Ylang ylang trees can also be grown in conservatories in temperate climates. Ylang ylang trees are fast growing, and usually reach an average height of 12 metres (40 feet), although some trees can grow to 42.5 metres (140 feet). When a tree is grown for essential oil production, farmers will prune it so stays shorter and flowers can be easily reached. Ylang ylang trees need lots of sun to grow, and are happiest in rainforest conditions. The trees have smooth, glossy green leaves and are often covered in fragrant flowers. When grown from seed, it takes 3-4 years for the ylang ylang to start blooming. At first, it will bloom twice a year; as the tree matures it will bloom almost constantly. Ylang ylang flowers last for a long time, and change colour as they develop. They start out as a greenish yellow that blends into the tree and gradually turn a bright, lemony yellow. Flowers are about 5 cm (2 inches) across, with narrow, gracefully trailing petals. Ylang ylang trees produce fruit, which turns black when ripe and provides a useful source of food for a wide variety of tropical birds and small mammals. In turn, the birds and other animals help scatter the seeds through their droppings. Moths pollinate the ylang ylang flowers, which release their strongest scent at night, to attract them. The bright, floral fragrance of ylang ylang, rich with notes of spice and fruit, is famous as a sensual, soothing fragrance, a nurturing, calming essential oil, and can also be found as a flavouring for drinks, candy and even ice cream. Ylang Ylang flowers release their most intense fragrance at night, to attract the night-flying moths that pollinate them. In order to capture the fragrance at its peak, ylang ylang flowers are picked at sunrise and then steam-distilled right away. At the peak of blooming season, pickers may gather 25 to 40 kilograms (55 to 88 pounds) of flowers per day. It takes about 200 pounds of flowers to make 1-2 litres of oil. Like olives, ylang ylang flowers can yield additional oil with more processing. The first, most intense distillation of the flowers is called “ylang ylang extra”. This most fragrant distillation is usually reserved for the perfume industry. The flowers can be distilled 3 or 4 more times, with the last, weakest distillation often used to make scented soap. Ylang ylang essential is often labelled based on its distillation number: for example, the oil gleaned from the second distillation would be labelled “ylang ylang II”. Ylang ylang is used in beverages, candies, chewing gum, and even ice cream! In Madagascar, ylang ylang is a common ice cream flavour, and sometimes this treat can be found in specialty ice cream shops around the world. In Ayurvedic tradition, ylang ylang essential oil is believed to have calming, cooling, uplifting and moisturizing tendencies. Ylang ylang essential oil can help vata imbalances by encouraging self-esteem, calm, relaxation, and sensuality. For those with pitta imbalances, the calm, cooling tendency of ylang ylang can help release anger and unwanted tension. Ylang ylang essential oil is suggested to soothe, tone and balance the skin and help moisturize hair, while the fragrance helps to relax and harmonize the mind and spirit, and encourage sensuality and love. Ylang ylang comes from the Tagalog word “ilang”, meaning wilderness. It may also be related to the term “ilang-ilan”, meaning rare. 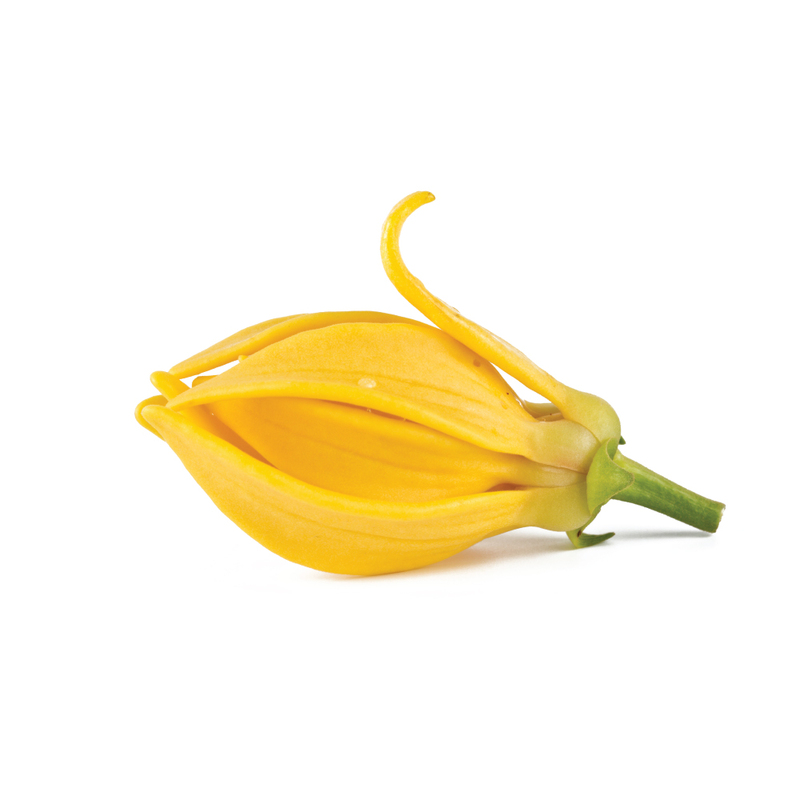 Ylang ylang is sometimes translated as “flower of flowers”. According to Philippine myth, the lovely, flowering ylang ylang tree came about when Ilang, a beautiful girl, falls in love with a boy she is not supposed to marry. Before they can come together, she is transformed into a tree (directly, in some versions, and after her death in others), and her lover cries for her: “Ilang! Ilang!”. In her travels through the South Pacific, anthropologist Margaret Mead noted that ylang ylang was commonly scattered on the beds of newlywed couples. It may not be coincidental that the aroma of ylang ylang is thought to be aphrodisiac in nature. In the wiccan tradition, ylang ylang is associated with the planet Venus. Ylang ylang can be used as a love charm, and it is said that the aroma helps dispel fear and promote self-confidence. Because the fragrance is soothing and tension-taming, it is also used in spells that are thought to invoke a calm, meditative state. It is also believed to be helpful in dispelling negative thoughts and emotions. Combining its love-promoting and soothing properties, ylang ylang is also said to help promote self-acceptance and self-love. Everywhere ylang ylang grows, the flowers are a popular decoration, whether placed into the hair or woven into wreaths, or placed in rooms to fragrance the air. Ylang ylang became known to European explorers in the 1600s, and over time, the fragrance became popular across Europe. Ylang ylang became so popular that it started to influence interior design. Around 1783, a barber name Alexander Rowland invented Macassar oil, a mixture of coconut or palm oil, ylang ylang essential oil and a few other oils. It was said to cause the growth of shiny, lustrous hair. Within 20 years, macassar oil became so popular that anyone who valued their furniture was forced to start using antimacassars: decorative cloth drapes for the tops of chairs that prevented the rich oil from staining upholstery. Macassar oil was reportedly named for the Indonesian port of Makassar, where the ingredients were sourced. The first commercial cultivation of ylang ylang began in Manila, in the 1800s. However, in the 1700s, French colonists had introduced ylang ylang to the island of Reunion, and by the early 1900s, it was also cultivated on the islands of Comoros and Madagascar. In the 1920s, ylang ylang was incorporated into one of the most famous perfumes of all time—Chanel No. 5. There are hundreds of other perfumes that incorporate the scent as well, making ylang ylang one of the perfume industry’s essential ingredients. During the 20th century, the Philippine ylang ylang industry declined, and Comoros became the world’s main supplier of ylang ylang essential oil. Ylang ylang now represents a full tenth of Comoros’s annual export revenue. However, in recent years, efforts have begun to revive the Philippine industry. Because they represent an ongoing source of income, ylang ylang trees are an attractive income centre for struggling areas, and they help reforest cleared areas. Because of this, ylang ylang trees are an economic and environmental win. By January 2017, a ylang ylang initiative in Pangasinan province had planted 200,000 trees, with plans to plant thousands more. Ylang ylang essential oil contains up to 161 individual compounds. The chief components of ylang ylang are linalool, germacrene, geranyl acetate, caryophyllene, p-cresyl methyl ether, methyl benzoate and sesquiterpenes. Most of the other components consist of terpenes, terpenoid esters, and alcohols.